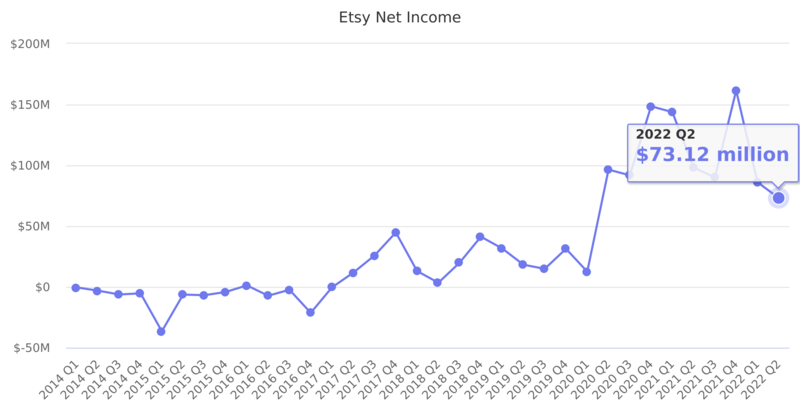 Etsy's net loss increased as a result of non-cash, non-operating expenses related to the updated global corporate structure that we implemented on January 1, 2015. These expenses include a non-cash $10.5 million increase to Etsy's tax provision, which brings Etsy's total tax provision to $10.7 million. These expenses also include a non-cash currency exchange loss of $20.9 million largely due to intercompany debt incurred related to the structure. Etsy's revised corporate structure was implemented to more closely align with its global operations and future expansion plans outside the U.S.
Last reported quarter 2018 Q3 it was $19.89 million, down by -23% year-over-year from $25.80 million. From $-29.90 million in 2016 it decreased by -374% to $81.80 million in 2017.